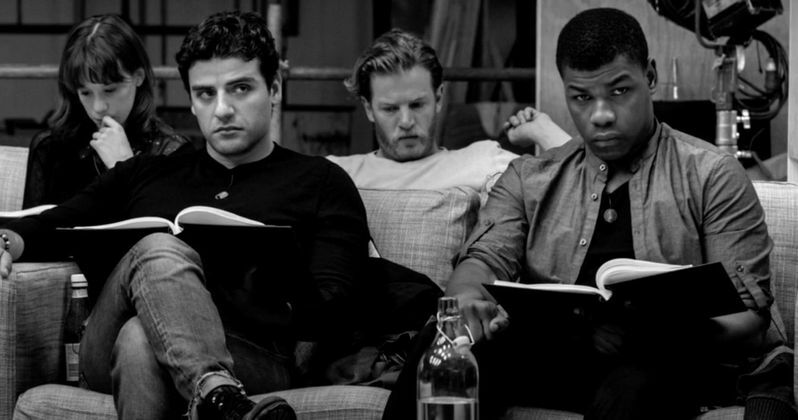 The first official image we ever saw from Star Wars: The Force Awakens was a black and white photo that took place at the table read. It introduced the new cast, and assured fans that the original cast was ready to return. Until now, we've never seen anything else from this important moment in Star Wars history. Today, as the Blu-ray is introduced at SXSW, we have our first footage from this legendary event. Which will surely excite fans of all-ages. We also have cool new images from The First Order landing at SXSW. In celebration of the documentary Secrets of the Force Awakens: A Cinematic Journey premiering at the Film Festival, The First Order TIE Fighter and stormtroopers landed in Austin today. The feature-length documentary, which is an in-depth bonus feature on the upcoming Digital HD and Blu-ray Combo Pack debuts at the Paramount Theatre on March 14th in Austin, Texas. The TIE Fighter will be stationed at South Bites at SXSW throughout the weekend for festival goers to experience the landing! Star Wars: The Force Awakens shattered box office records upon its debut to become the cinematic event of a generation with over $926 million domestic and $2.05 billion worldwide. the epic movie will be available to own early on Digital HD and Disney Movies Anywhere on April 1. It comes home on Blu-ray Combo Pack and DVD on April 5. The Story Awakens: The Table Read features cast members familiar and new as they reflect on the memorable day they all first came together to read the movie's script. Other special features included on the upcoming Blu-ray include Building BB-8, which shows how the filmmakers brought the newest droid to the screen, creating an instant fan favorite in the Star Wars universe. Crafting Creatures allows fans to watch movie magic as the filmmakers bring a cast of new creatures to life. And Blueprint of a Battle: The Snow Fight goes deeper into the epic, climactic lightsaber battle between Rey and Kylo Ren. Star Wars: The Force Awakens was directed by J.J. Abrams and written by Lawrence Kasdan & J.J. Abrams and Michael Arndt. Lucasfilm president and eight-time Academy Award nominee Kathleen Kennedy and J.J. Abrams, along with his longtime producing partner Bryan Burk, are the film's producers. Having established a musical legacy with his iconic scores for the previous six films in the Star Wars Saga, acclaimed composer John Williams returned to score Star Wars: The Force Awakens, ultimately garnering his 50th Oscar nomination for it. You can take a sneak peek at the infamous Table Read in the teaser below, along with photos of the First Order at SXSW.